What if you could lie down for an hour at a time and know that your cells are being released of stress and inflammation – and your body’s natural healing mechanism has been stimulated? Whether you are an injured athlete trying to get back into the game, a mom who is struggling with stamina due to chronic illness, or an on-the-go professional woman who knows those daily lattes are taking their toll, our NovoTHOR machine is the therapy to try. 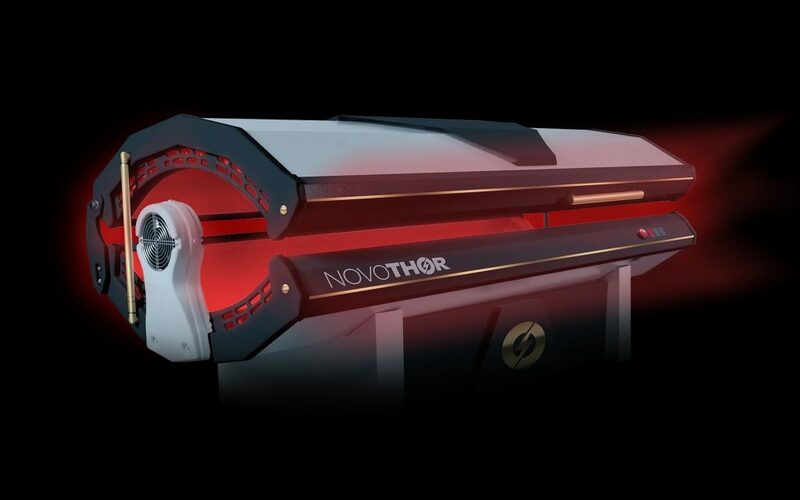 The NovoTHOR machine is a light bed, and it is a form of Photobiomodulation (PBM) Therapy. BPM therapy produces near infrared light, which is absorbed at the cellular level. This light stimulates tissue repair, increases the production of energy within the cells, and reduces inflammation and pain. In the past two decades, extensive research has been done at MIT and Harvard Medical School to support the effectiveness of PBM therapy. It has shown that oxidative stress can lead to chronic inflammation, which contributes to chronic diseases such as cancer, diabetes, cardiovascular disease, neurological disorders and pulmonary diseases. The red infrared light targets the cause of inflammation by reducing oxidative stress within the cells. This greatly reduces risk of chronic diseases and helps to reverse them. What is the difference between a NovoTHOR bed and a tanning bed? Tanning beds produce ultraviolet light rays; which are often harmful to the body. The light produced by the NovoTHOR bed is near infrared and on the opposite side of the light spectrum. Ready to try PBM therapy? Book your appointment below! Be sure to also check out all of our other therapies that can be used in conjunction with PBM.